Now we're getting closer to completion. 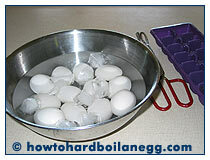 Next, the eggs need to be cooled prior to being peeled. The critical point here is to cool the eggs very quickly. Why do we need to cool the eggs as fast as possible? Because this is the best way to prevent a greenish ring from forming around the yolk. This unattractive green color results from a chemical reaction between the iron in the egg yolk with sulfur found in the egg white. When the egg is heated, the two combine to form green ferrous sulfide and smelly hydrogen sulfide gas. When the eggs are rapidly cooled, this natural chemical reaction is minimized. After this time, all of the eggs should feel fairly cool. 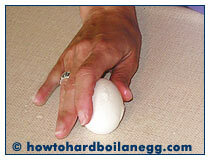 Remove the eggs one by one and gently crack their shells by tapping them lightly on a hard surface. Be careful not to smack them too hard or you are likely to whack them wide open. An egg for egg salad will still be salvageable if this happens, but if you want them for deviled eggs, you will have lost an egg. In the picture, you can see that the surface of the egg is looking rougher. You want to create a lot of cracks, so that the surface of the egg feels quite broken and fragile almost. Return each egg (once you have cracked the surface) to the bowl of water for another 10 minutes or so to allow a bit of water to seep under the shell to help faciliate peeling. So, you crack the shell, add it back to the water, and by the time you have finished cracking the surfaces of the other eggs, you will have let the first egg rest in the water for about the right amount of time.